Whether you're at the mountains or in the city, 'Parka Women Mont Tremblant Arctic North Grape' is perfect for beating the cold weather blues! This parka was inspired by the beautiful mountain Mont Tremblant. This jacket tames the winter. It is warm, comfortable, and classy. The long, slim fit is tailored to make your feel and look the best all winter long. 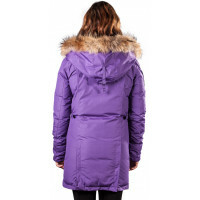 Bundle up in Arctic North Women Mont Tremblant Grape Parka - it's a must-have for colder weather!